In Buffalo Tattoo Removal has been added to the Aesthetic Associates Centre with the addition of the Picosure Laser. Erase unwanted tattoos and pigment with PicoSure, the most advanced laser treatment available for safe and effective tattoo removal. PicoSure targets unwanted ink more effectively than ever before, successfully removing difficult ink colors, such as blue and green, as well as previously treated tattoos. Fewer treatments, improved recovery time, and faster results are achievable with PicoSure’s groundbreaking picosecond technology. The Aesthetic Associates Centre uses the PicoSure Laser. Energy is delivered to the tattoo, targeting the ink and breaking it down into smaller particles. The particles are eliminated by the body's natural processes resulting in a lightening of the tattoo ink. The number of laser treatments needed for tattoo removal is dependent on a number of variables such as ink type, size of the tattoo, type of laser used, lifestyle habits, etc. During your consultation at the Aesthetic Associates Centre, either Dr. Shatkin or his staff provider will evaluate your tattoo and recommend a realistic treatment regime to help you achieve the best results. The Picosure laser typically requires less than 1/2 the number of treatments that are needed with older laser machines. While it typically it takes 4-6 weeks for the body to absorb ink particles, every patient and tattoo responds differently. Following the recommended post treatment protocol will likely improve the results and reduce the chance of adverse events. Yes, the PicoSure laser provides energy precisely enough that a small amount of a tattoo can be removed without affecting the surrounding tattoo. The PicoSure tattoo removal laser is the most advanced, and with very short treatment pulses, discomfort is minimum. Dr. Shatkin and his staff will work with you on the best pain management option for you based on your individual situation. Blisters and scabs can be a normal response to tattoo removal. Proper dressings and careful care after treatment will insure good healing. 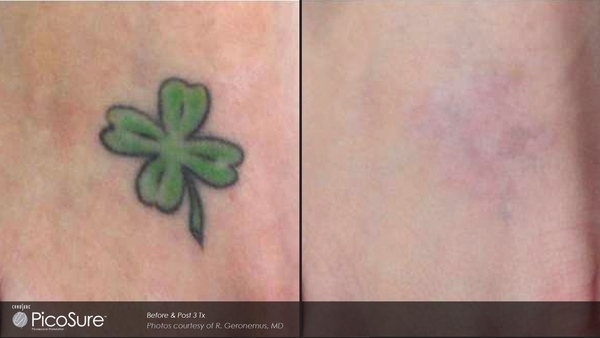 Most insurance companies will not cover laser tattoo removal since it is considered an elective cosmetic procedure. For your convenience, the Aesthetic Associates Centre can help with payment plans and installment options if needed.